It is copyright © Ben Lerner and Jacket magazine 2009. See our [»»] Copyright notice. 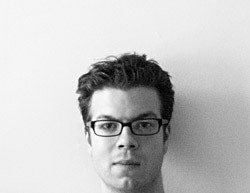 Ben Lerner’s books are The Lichtenberg Figures (Copper Canyon, 2004) reviewed in Jacket 28, Angle of Yaw (Copper Canyon, 2006) reviewed in Jacket 37, and the forthcoming Mean Free Path (Copper Canyon, 2010), in which these poems appear. Ben is interviewed by Kent Johnson in Jacket 26.